A George Karl personal appearance, George Karl speaking engagement, or George Karl endorsement will reflect well on your company. To hire George Karl now for any corporate appearance, fundraiser, motivational speaker event, personal appearance, autograph signing, or website endorsement please contact our celebrity agents at 1-877-6-SPORTS. We will contact George Karl or contact George Karl's agent and provide you with the booking fees and availability immediately upon your request. Direct Sportslink is the only sports speakers bureau and talent booking agency based in the United States securing only sports talent for corporations, associations, and organizations for motivational speaking engagements, personal appearances, and endorsements. We are the premier sports celebrity booking agency and a sports celebrity procurement expert. Accordingly, we will provide you with any relevant George Karl website information and booking agent details so that you can hire George Karl for your next event. After a college career at the University of North Carolina he signed with the ABA's San Antonio Spurs in 1973. When the Spurs joined the NBA in 1976, Karl began his two-year NBA playing career. After his playing career, Karl became an assistant coach for the Spurs. Karl then moved on to the Continental Basketball Association (CBA) as head coach of the Montana Golden Nuggets (Great Falls). 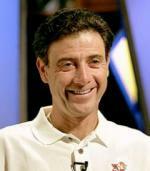 As coach of the Golden Nuggets, Karl won CBA Coach of the Year twice, in 1981 and 1983. In 1984, Karl became the head coach of the NBA's Cleveland Cavaliers until he was fired in 1986. He later coached the Golden State Warriors until 1988, achieving a winning record and a first-round playoff upset in his first season, before being fired after a terrible start to the 1987-88 campaign. 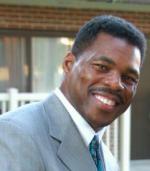 He coached briefly in the 1989 season for the Utah Jazz as an assistant. Karl returned to the NBA as coach of the Seattle SuperSonics from 1991-1998, leading them to the NBA Finals in 1996 where they lost to the Chicago Bulls in six games. In all seven of his seasons in Seattle, the team made the postseason, winning three division titles, and eclipsing the 50-win mark in every year that he was the full-time coach. In 1998, Karl moved to the Milwaukee Bucks as head coach, lured by an excellent contract. He rebuilt a struggling team in his first three years, steadily increasing win totals, and guiding the team within one game of the NBA Finals in 2001. However, his team collapsed down the stretch in 2002, falling from the number one spot in the Eastern Conference in January to a season that ended out of the playoffs. He was fired after another underachieving season in 2003, where his team made the playoffs with a win total of just over the .500 mark. He coached the US national team in the 2002 FIBA World Championship. He returned to the NBA in 2005 when he became head coach of the Nuggets, taking over from interim head coach Michael Cooper on January 27 and leading the team on an incredible run to the postseason. On July 27, the Nuggets announced that Karl had prostate cancer. He has enjoyed a resurrection of his career with the Denver Nuggets. After leaving the Nuggets he agreed to coach the Sacramento Kings starting in 2015. Karl's son Coby announced he had thyroid cancer during his collegiate career. 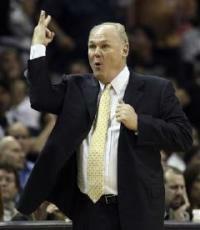 George Karl would be an ideal keynote speaker for a cancer related fundraiser. Based on your interest in George Karl as a speaker or for a personal appearance, Direct Sportslink has provided you additional links below for other sports talent with similar appearance fees, speaker topics, and categories that match George Karl.